No one can accuse twenty-three year old Claire Boucher of resting on her laurels. Geidi Primes arrives on the heels of this May’s split EP Darkbloom- and with a new album set for release this January, the Canadian artist is set to be as immersive in presence as she is on record. However, not only is Boucher startlingly ubiquitous, but the quality of these rapid-fire releases is, frankly, a little astounding. Whether it’s via the petite derangement of Darkbloom’s “Vanessa” video or the spooky sultriness of her most recent album, Grimes is oh so relentlessly post. Sure, both the image and sound aren’t exactly original- Boucher is indebted to almost an entire sphere of influence ranging from Fever Ray to the widespread acceptance of all things electro-goth/”witch house". Geidi Primes, though, is a masterfully hypnotic experience from beginning to end, at least on par with its predecessors in the genre. Over it’s brief half-hour runtime, Geidi Primes plays like a perversely haunted love letter. Boucher uses sugary vocals to disguise a shifty undercurrent that is equal parts coquettish and sinister. Album opener “Caladan” slinks through a Morricone-esque opening sample before soaring into an ethereal chorus that suddenly devolves at just under the two-minute mark into a Crystal Castlesish drone. This confident duplicity is par for the course on Geidi Primes. Even the more stripped-down tracks such as “Rosa” and “Feyd Rautha Dark Heart” exude a quiet menace prone to addictive replay value. A relentless carousel of subtle intensity, Geidi Primes reaches an unnerving pitch around its halfway mark with “Gambang” as sounds are layered upon looped samples all the while threatening to spiral out of cohesion at any moment. The delicate romanticism of “Venus In Fleurs” draws the listener back from this auditory precipice. Yet in typical Grimes fashion, “Grisgirs” plunges us right back into the mix where a wall of synth somehow cooperates with an endearingly scratchy beat which acts as a delicious bridge to the album’s final two tracks, “Shadout Mapes” and the music boxy “Beast Infection” (yes there is a song called “Beast Infection” and yes, it is music boxy). And have I mentioned Boucher’s tendency to slip in and out of a dreamy, far Eastern-inspired falsetto? Forget it. I’m out of adjectives when it comes to Geidi Primes. Like I said, this thing is oh so post. Nice review, and sweet blog, dude. Check ours out sometimes. 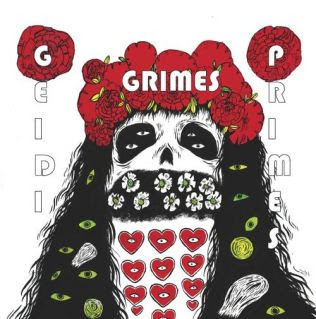 This is what we thought about the album in our Grimes - Geidi Primes Review.